It is known that Europe has the most complex regulatory framework for the registration of biologicals, which does not seem aligned with the tendency to organic produced food of the European consumers when shopping at supermarkets. But it appears things are about to change when we look at the latest statements released by the European Parliament on low-risk “pesticides of biological origin”, opening the way to regulatory changes and a better understanding to support the use of biologicals in plant protection. Worldwide the use of conventional pesticides has been increasingly a subject of public debate in the press, but above all in social platforms. And innovation of new active ingredients appears to be decreasing in the arena of conventional active substances while the number of existing ones, available in the EU market, is also decreasing. These considerations affect not only Europe, but also the rest of the world, because companies are bringing their biological products to other geographical regions and authorities in those countries need to respond locally with national regulations. Biologicals cannot control all diseases/pests, in all situations and all crops, but using exclusively conventional pesticides in disease control programs is no longer a single option. 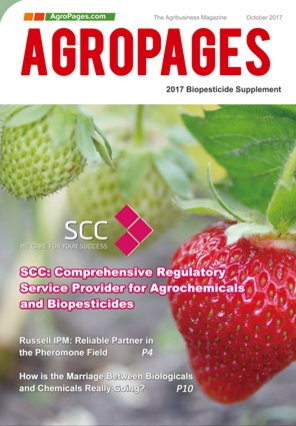 This article attempts to drive you on a short tour of examples, where the regulatory framework for biopesticides in different countries, outside Europe, is briefly presented . Preparing a dossier for a submission outside of Europe is an exciting project. In many cases the language, agronomic practices, and (cultural) understanding of local authority requirements are key, but it is more important is to change your mindset, considering and repeating out loud: “this is not Europe”. Surprisingly, it is pleasant to see that developments on regulations in different regions are not always as complicated as we are used in Europe, with successful registrations being more of a rule than an exception. The United States of America and Canada are known in the regulatory world for their friendly approach towards biopesticides, but what about other countries? South Africa defined in 2015 what we call biopesticides in Europe as: “biological remedy”, “bioproducts”, “biological products” and “biopesticides”. The particularity is not only the definition, but the fact that the South African Guideline, containing only 21 pages, lays down the registration requirements for all biological remedies and biological fertilizers including biostimulants, biofertilizer, plant growth promoter, and inoculants . Micro-organisms, macro-organisms, semio-chemicals, enzymes and hormones, plant extracts, legume inoculants or inoculants can be active ingredients of any of those products. The usually large data sections of ecotox and environmental fate are excluded from the data set, except the requirement to demonstrate that the effects on non-target organisms such as beneficial insects and pollinators are negligible and manageable (efficacy trials). Of course, there is also the toxicology part required for the evaluation, but not as complicated and challenging as we know from the EU. Latin America (LATAM) is a growing and active region for biologicals, but in the regulatory framework it is still very challenging from the registration point of view. Nowadays, looking at what is going on in Europe, it is interesting to see what those countries exporting to Europe have as national regulatory framework. Mexico located up n the northern zone of LATAM map and actually belonging to the NAFTA region, differs from the regulatory rules set up in USA and Central America. A few sections are summarized here. The toxicological information is one of main requirements, focusing on oral toxicity and in eye/skin irritation information, along with pathogenicity in humans, and hyper sensibility/allergy studies. The ecotox section encompasses requirements on general information needed for flora and fauna: lethal concentration endpoints (acute studies) in a fish species and a lethal concentration endpoint for an aquatic organism (alga OR invertebrate). Also, studies in “populations of beneficial insects and pollinators” are part of the data requested for registration. Central America: Recently, in the frame of Guatemala´s Protocol, the Resolution 383-2017 was signed by Guatemala, Honduras, El Salvador, Costa Rica, Nicaragua, and Panama. The new law sets up the registration requirements for microbial pesticides for agricultural use and has an interesting disclaimer: “This Central American Technical Regulation does not correspond to any other international norm or regulation”. All technical sections are addressed, studies at strain level are requested, and there is only a reference to the American guidelines (OCSPP ). This new law was published in April 2017 and entered into force from 28th July 2017 onwards. In the South, Chile is a country known for exporting vegetables, fruits, wines, and other food products to Europe. Therefore it is interesting to know that Chile, in its main regulatory framework (Resolution N°1557-2014 ), classifies Natural Pesticides as formulated products containing “natural substance” as microorganisms (indigenous or exotic species), and/or natural plant extracts (based on vegetal, animal or mineral origin). Yet, Chile has an extra regulation which establishes the rules for biological material entering into Chile (Resolution 229/2001) . Non-standard products which do not fit to the general regulatory framework of “conventional” pesticide are regulated there: “Exotic biological control agents” is the definition for agents which can be beneficial to be used in agriculture. In summary, the rules for Biopesticides registration are not that clear; fortunately, farmers do have some microbial agents such as Bacillus thuringiensis available in the market. In Colombia, a “Bioins” is a biological natural product, environmentally friendly, and is used in agriculture for the purposes of plant protection, as well as plant growth regulator in plants . Microbial agents are the main focus of products registered, and viruses, bacteria, and fungi are used for “biological control” in crops. The registrations rules for plant extracts and “biochemical products” are currently under developed for plant protection purposes. Worth mentioning here is that the definition of “Microbial agent” in the Columbian law refers to a “living organism”. The Decree 1843/1991 is applicable for all those type of biopesticides. Most regulations seem to contain the experience of Europe and the United States/Canada, and even if some exclude the national health authority from the registration process, toxicological tests are nonetheless required. Registering a biopesticide in any country of the globe is not only challenging, but also tests your skills in being innovative, flexible, and open minded, as well as exercising your multicultural skills, in order to understand the best way to present your best knowledge in a registration dossier.